Like most crafters, I’m always on the hunt for that perfect scarf pattern. This can be a challenge if you plan on making a handful of scarves for Christmas presents and you want them to all be different! I decided to try my hand at making my own pattern for unique look, and I was met with great success! So here’s the pattern for my Cascading Chains scarf. This scarf works up super quick–it took me maybe an hour–and the hardest part is keeping correct count of your chains. It looks great in monochrome, but it would look wonderful in any color combination! NOTE: This scarf is made using two strands of yarn at once. If you want to make the scarf in a solid color, use two skeins of that color. 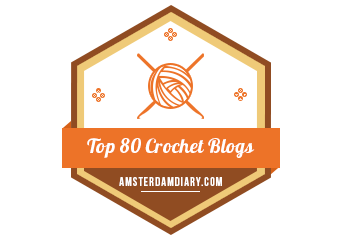 Button of your choice–the larger the better! 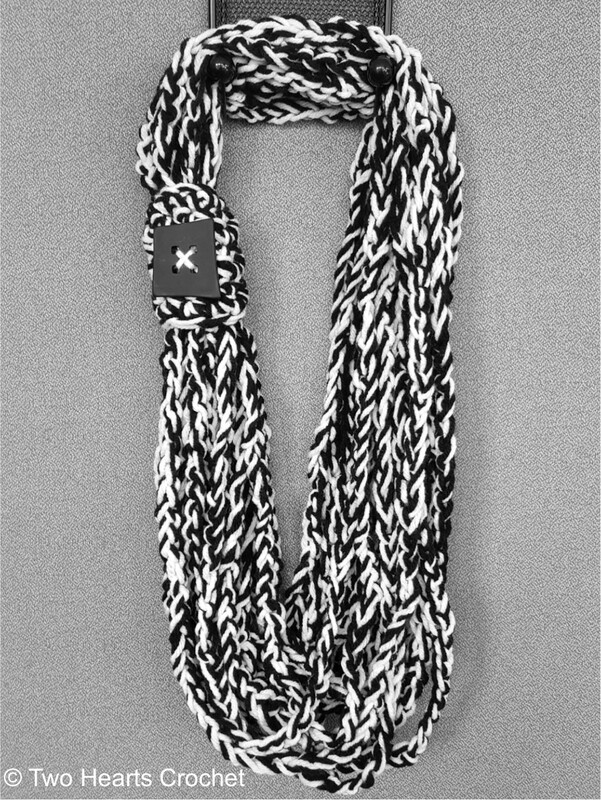 This scarf is made up of 15 chains of varying length. Chain #s 1-2: With both strands of yarn, ch 82. Join to the 1st ch st with a sl st–make sure your chain is not twisted! Begin next chain. Chain #s 3-4: Ch 85. Join to the 1st ch st with a sl st–make sure your chain is not twisted! Begin next chain. Chain #s 5-8: Ch 87. Join to the 1st ch st with a sl st–make sure your chain is not twisted! Begin next chain. Chain #s 9-11: Ch 90. Join to the 1st ch st with a sl st–make sure your chain is not twisted! Begin next chain. Chains #s 12-13: Ch 92. Join to the 1st ch st with a sl st–make sure your chain is not twisted! Begin next chain. Chain # 14: Ch 95. Join to the 1st ch st with a sl st–make sure your chain is not twisted! Begin next chain. Chain # 15: Ch 95. Join to the 1st ch st with a sl st–make sure your chain is not twisted! Fasten off, leaving long tails. Gather your scarf chains along the so that they form a loop as though you were ready to put it on and wear it. You can gather the chains along the “top” where each chain ends and the next one begins (the beginning of each “row”). Set your scarf aside so that the chains won’t get tangled. Continue to make the scarf band. With both strands of yarn, ch 11. Row 1: Starting in the 2nd chain space from hook, work 1 sc in each ch across. Ch 1 and turn. Rows 2-6: Work 1 sc in each ch across. Ch 1 and turn. Row 7: Work 1 sc in each ch across. Fasten off, leaving long tails. Take the band and wrap it around the scarf where the cascading chains begin/end. Fold the band over the scarf chains onto itself. Using the tail ends of the yarn of the scarf band and a yarn needle, carefully sew the ends of the scarf band together. Weave in ends. 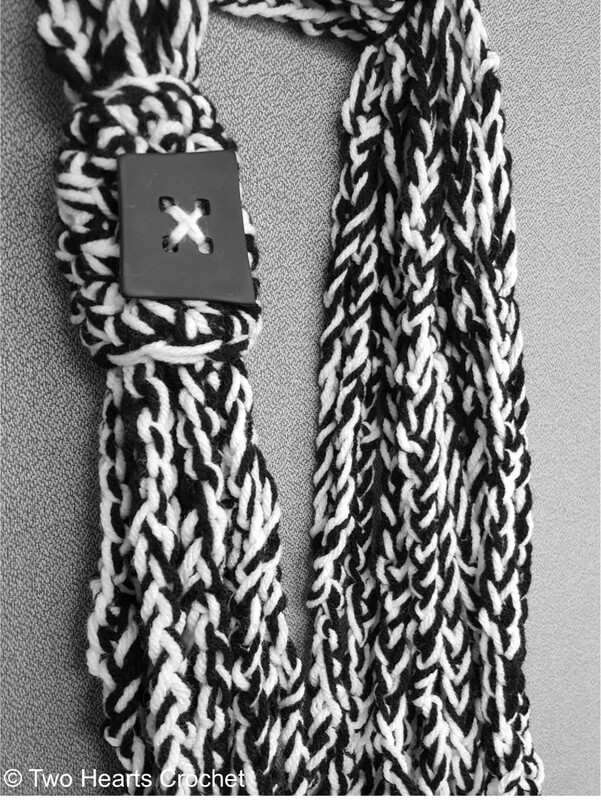 Weave in the ends from the scarf chains (there should be four–two from the beginning and two from the end). Using a strand of yarn in the color of your choice and your yarn needle, carefully sew your button of choice onto the scarf band. Make sure the button is nice and secure so that it won’t fall off! Weave in ends. There you have it! Your scarf should look a little different than the one pictured–I made my chains in varying lengths, but I mixed them all up instead of having them get longer as the scarf went on. Yours will cascade nicely–hence the name! What do you think? Questions, comments–leave them below!